Every Friday evening without fail when the sun resembles a giant orange and is starting to dip into the blue ocean. Old Ed comes strolling along the Florida beach to his favorite pier. Clutched in his bony hand is a bucket of shrimp. Ed walks out to the end of the pier, where it seems he almost has the world to himself. Everybody’s gone, except for a few joggers on the beach. Standing out on the end of the pier, Ed is alone with his thoughts – and his bucket of shrimp. If you were sitting there on the pier with your fishing line in the water, Ed might seem like “a funny old duck,” as my dad used to say. Or, “a guy that’s a sandwich shy of a picnic,” as my kids might say. To onlookers, he’s just another old codger, lost in his own weird world, feeding the seagulls with a bucket full of shrimp. His full name: Eddie Rickenbacker. 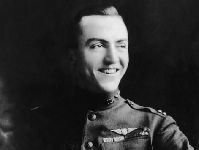 He started Eastern Airlines and was a famous flying Ace back in World War I. On one of his flying missions across the Pacific, he and his seven-member crew went down. Miraculously, all of the men survived, crawled out of their plane, and climbed into a life raft. That afternoon they had a simple devotional service and prayed for a miracle. They tried to nap. Eddie leaned back and pulled his military cap over his nose. Time dragged. All he could hear was the slap of the waves against the raft. Suddenly, Eddie felt something land on the top of his cap. It was a seagull! Then they used the intestines for bait. With it, they caught fish, which gave them food and more bait and the cycle continued. With that simple survival technique, they were able to endure the rigors of the sea until they were found and rescued after 24 days at sea.